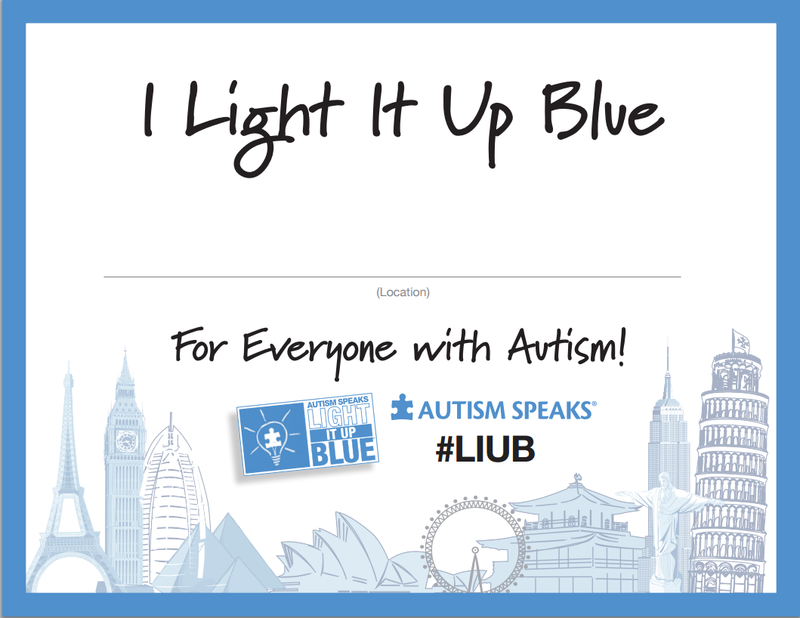 Besides being autism organizations, they all have this in common: no mention of “Light It Up Blue” on their webpages today. Each April 2nd, Autism Speaks celebrates the start of its signature campaign, Light It Up Blue, along with the international autism community in recognition of UN sanctioned World Autism Awareness Day and April, World Autism Month. They are clear–it’s not an autism event, it’s an Autism Speaks event. Apparently “along with the international autism community”. Which doesn’t appear to be joining in. Blue, by the way, is not the color of autism (it doesn’t really have one). Blue is the color of Autism Speaks. Stephen Shore alerted people on Facebook recently that change was coming to Autism Speaks. Stephen has now shown us that the mission statement has changed. At Autism Speaks, our goal is to change the future for all who struggle with an autism spectrum disorder. We are dedicated to funding global biomedical research into the causes, prevention, treatments and a possible cure for autism. We strive to raise public awareness about autism and its effects on individuals, families, and society: and we work to bring hope to all who deal with the hardships of this disorder. We are committed to raising the funds necessary to support these goals. Autism Speaks aims to bring the autism community together as one strong voice to urge the government and private sector to listen to our concerns and take action to address this urgent global health crisis. It is our firm belief that, working together, we will find the missing pieces of the puzzle. Click the links to learn more about our leadership, our board of directors, our scientific boards and our family services committee. As Stephen Mark Shore wrote on his Facebook page about the change: “Cure” has been replaced with advocacy, support, and acceptance through the lifespan. It was nice to finally see someone from Autism Speaks make a clear statement without a lot of equivocation and “leave the door open” language. But what I think is nice and what Bob Wright, the founder of Autism Speaks, thinks is nice are two different things. The Wright family is, at least, sympathetic to the idea that vaccines cause autism (and, in at least one case, very outspoken on the idea.) So perhaps I should have been surprised when Autism Speaks put on their website Rob Ring’s statement together with a statement by Bob Wright. Over the last two decades extensive research has asked whether there is any link between childhood vaccines and autism. Scientific research has not directly connected autism to vaccines. Vaccines are very important. Parents must make the decision whether to vaccinate their children. Efforts must be continually made to educate parents about vaccine safety. If parents decide not to vaccinate they must be aware of the consequences in their community and their local schools. And that was sad. A sad move by Autism Speaks. A sad move by Bob Wright. I so want Autism Speaks to be an organization I could support. And sometimes they seem to be moving in that direction. But, in the end, they are still clinging to ideas like “vaccines cause autism”, ideas that cause a lot of harm within the autism communities. And they also take a very stigmatizing approach to the discussion of autism, but that is another discussion. Autism Speaks pretends to be a science driven organization, but they just aren’t. The founder is the founder and his opinion means more than the results of scientific studies as expressed by their own Chief Science Officer. Tomorrow is Autism Awareness Day, by some calendars at least. The United Nations, for example made a resolution in 2007 to designate April 2nd as “World Autism Awareness Day”. Resolution adopted by the General Assembly on 18 December 2007 [on the report of the Third Committee (A/62/435)] 62/139. 4. Requests the Secretary-General to bring the present resolution to the attention of all Member States and United Nations organizations. While I’m sure that Autism Speaks lobbying had much to do with that resolution, it’s an awareness event. No where do you see any mention of Autism Speaks nor statements that we should “light it up blue”. Yet over the years, Autism Speaks has made autism awareness into autism speaks awareness. And no where is that more obvious than on April 2nd with their “light it up blue” event. Is blue the color of autism? No. It’s the color of Autism Speaks. But Autism Speaks is out there asking people to shine blue lights for autism awareness. A whole section of their shop (yes, they have an online shop) is devoted to “light it up blue” merchandise. All complete with the Autism Speaks logo. Here’s the text from the Autism Speaks web page on how to “light it up blue”. Each section brings you back to Autism Speaks. Shine a blue light..and project the Autism Speaks logo. Wear blue, including autism speaks pins or accessories. Blue=Autism speaks, basically. In honor of people with autism worldwide, iconic landmarks, hotels, sporting venues, concert halls, museums, schools, universities, bridges, retail stores, and thousands of homes will light blue beginning on April 2! Change outdoor or indoor white bulbs to blue bulbs. Supply Autism Speaks lapel pins, bracelets, or other blue accessories to wear during the month of April. Post your photos on Facebook, Twitter, Google+, Instagram, or Flickr with the hashtag #LIUB to be a part of the global autism awareness movement! Distribute information about autism, World Autism Awareness Day, and Light It Up Blue in your establishment, neighborhood, or company. Invite a local Autism Speaks representative to speak to your staff, school, or town about autism and the Light It Up Blue campaign. Reach out to local media to let the community know about your great work for the autism community and your support of autism speaks! Hey, you can take a “light it up blue” selfie. Complete with Autism Speaks logo. Autism Speaks is corporate autism. They do some things I appreciate and many things I really, really (really) don’t. For example, perpetuating the vaccines-cause-autism idea, an idea which may be second only to the refrigerator mother idea in causing harm to our community. Just in the past couple weeks Autism Speaks had to put out a new message on the idea, because the science based and helpful message by their Chief Science Officer conflicted with the non-science educated founder’s beliefs. Autism Speaks doesn’t have autistic voices in important positions within the organization, an amazing position given the sizable self-advocate population they claim to serve. Autism Speaks has a history of perpetuating stigmatizing messages (search for “I am autism” if you are unaware of this). Autism Speaks has funded quality research over the years and I appreciate that. But every time I start thinking Autism Speaks is starting down a good path they do something that reminds me: they are not my family’s autism organization. They don’t represent my values. They don’t represent my family. I won’t be “lighting it up blue” tomorrow. I won’t be encouraging people to “light it up blue”. I hope people will be more aware of the needs of people like my kid. I hope more that they will act. I will follow up with another post, but I’ll say it here now: remember the phrase “think globally, act locally”? Feel like donating to an autism charity? I bet you have an autism school in your area and autism schools need donations. I bet there are adult programs in your area that could use some support. That’s my suggestion for April 2nd. Autism Speaks: The results of this research are clear: Vaccines do not cause autism…but doesn’t let that statement stand alone. 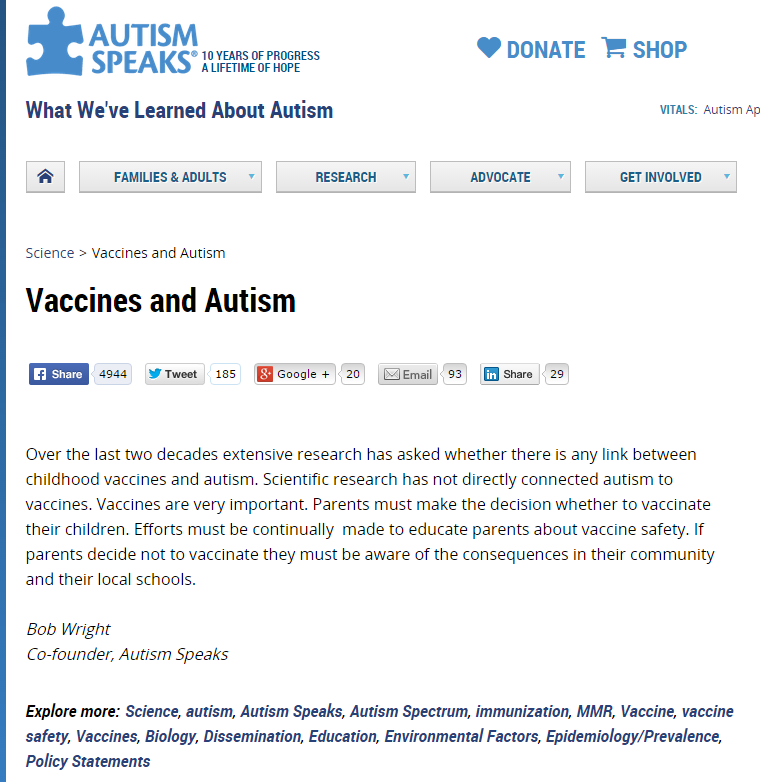 Autism Speaks has come out with some very strong statements about autism and vaccines. And the back peddled. In the past Autism Speaks had been sympathetic towards the idea that vaccines cause autism. More than sympathetic, some would say. Such a clear statement as above would have been unthinkable from Autism Speaks only a few years ago. I wish they had made these statements earlier, but I am glad they are making these statements now. The vaccine hypothesis has been the most damaging idea in autism since the refrigerator mother theory. With Autism Speaks position as a well known autism organization, perhaps even fewer families will get caught in the vaccines-cause-autism trap in the future.Here’s the way the Autism Speaks vaccines and autism page looked just last year. It includes many problematic statements and concludes: “A list of publications that used VAERS information to study associations with autism can be found here“. “Here” is a link to pubmed with the search terms “vaers” and “autism”. No surprise, it’s a list that is padded out by works by Mark and David Geier. The Geiers have been performing poor research for years and have been discussed here at Left Brain/Right Brain many times. The above statement by Mr. Ring was picked up by the press in February as it was so clear. It’s a fairly stilted paragraph in my read. It comes across as though Mr. Wright is trying to appear to ride the fence while at the same time pulling back dramatically from the clear statement by Mr. Ring. Scientific research has not directly connected autism to vaccines? Even with that, I can’t imagine that admitting that vaccines are “important” will go over well in some circles. Close circles. Even “important” is to positive a word for some. But, seriously, here we have an invention that has saved more lives that possibly any other in medical history and we get “important”? Yes, Mr. Wright, efforts must be made to educate parents about vaccine safety. That’s what your chief science officer did. Sadly, you can’t let Autism Speaks be a science led organization. Note: I accidentally published an early draft of this article yesterday. Is Autism Speaks supporting vaccine-autism causation proponent Congressman Bill Posey? Someone forwarded an email from the “Autism Action Network” recently. The email asked people to support Congressman Bill Posey’s election campaign by attending a fundraiser. Looks like a few big donors to Mr. Posey were going to attend, including Sallie Bernard of SafeMinds and Autism Speaks. Ms. Bernard certainly is with both organizations, but I wonder if she was attending as an Autism Speaks officer or if Autism Speaks was even aware that their name was being used to promote the fundraiser. Perhaps Ms. Bernard wasn’t aware that her Autism Speaks affiliation was being used this way. I’ve seen some of my affiliations used where I didn’t expect nor want them. Perhaps Ms. Bernard was aware that the AS affiliation was being used in this advertisement, but Autism Speaks wasn’t. Perhaps Autism Speaks was aware and supported this effort. I’m not betting heavily on that last option though. The Autism Speaks name adds a legitimacy to this fundraiser that the other groups just can’t. The Canary Party and Health Freedom (which I assume to be Americans for Health Choice) are basically the same people with “Canary Party” as a political party and “heath freedom” as a charity. The Canary Party/Health Freedom team is led by the same people who funded large donations to Oversight & Government Reform Committee Chair Daryl Issa ($40k plus). JB Handley is not as vocal as he once was, but he founded Generation Rescue on the notion that “autism is just a misdiagnosis for mercury poisoning“. Sky Horse publishing is boutique publisher of many of the books on vaccines and autism, including “Age of Autism” and books by Andrew Wakefield. Barry Segal (Focus Autism) has been a large supporter of groups like Generation Rescue, the Age of Autism, SafeMinds and is very vocal on his belief that vaccines cause not only autism, but many other health problems as well. Gary Kompothecras has been funding Mr. Posey for years and is an autism parent and benefactor of groups promoting the vaccine/autism idea. Without Autism Speaks’ name added to this, this would be very clearly all about a small but wealthy group of people pushing the failed ideas of vaccines and autism. People with failed and damaging ideas have the right to lobby members of congress along with everyone else. I, for one, am glad that the vast majority of Congress has moved on from the vaccine/autism-epidemic idea. I look forward to the day when that majority reaches 100%. The U.S. Interagency Autism Coordinating Committee (IACC) will have two new members when it meets next week. The press release is below. The new members are Wendy Chung from Simons Foundation and Robert Ring from Autism Speaks. The Simons Foundation is the largest non-governmental funder of autism research and previously had a member on the IACC (Dennis Choi). My understanding is that Mr. Choi took a position working with a foreign government and that conflict required him to resign the IACC. Geri Dawson is still on the IACC and started this session working for Autism Speaks. Ms. Dawson has since left Autism Speaks. The Department of Health and Human Services today announced the appointments of Wendy Chung, M.D., Ph.D., and Robert Ring, Ph.D., as public members of the Interagency Autism Coordinating Committee (IACC), a federal advisory Committee composed of federal agency officials and appointed community stakeholders that provides coordination and a forum for public input on issues related to autism spectrum disorder (ASD). Prior to her departure, former HHS Secretary Kathleen Sebelius appointed Dr. Chung, Director of Clinical Research for the Simons Foundation Autism Research Initiative (SFARI), and Dr. Ring, Chief Science Officer of Autism Speaks, to join the IACC in order to provide additional perspectives and expertise to the Committee. Dr. Chung and Dr. Ring serve as leaders within the two organizations that are the largest private funders of autism research in the United States. Both organizations were previously represented on the Committee by individuals who were appointed in 2012, but who have since left or changed affiliation. Dr. Insel, Chair of the IACC and Director of the National Institute of Mental Health, welcomed the expertise and dedication that Dr. Chung and Dr. Ring bring to the IACC. “Both Dr. Ring and Dr. Chung will be important additions to the Committee, given the depth of their scientific and clinical experience, and their dedication to improving the lives of people on the autism spectrum,” he said. Dr. Chung, in addition to directing clinical research at SFARI, served as a member of SFARI’s scientific advisory board. Dr. Chung is also the Herbert Irving Associate Professor of Pediatrics and Medicine and Director of Clinical Genetics at Columbia University College of Physicians and Surgeons, where she is the principal investigator for the Simons Variation in Individuals Project (Simons VIP), funded by the Simons Foundation. Dr. Ring, who has been the Chief Science Officer of Autism Speaks since 2013, also serves as the Chairman of the Board of Delivering Scientific Innovation for Autism (DELSIA), the venture philanthropy arm of Autism Speaks, and leads Autism Speaks’ collaboration with the Simons Foundation to launch the Autism BrainNet, a privately-funded multisite brain banking effort focused on supporting autism research. Dr. Ring previously served as Autism Speaks’ Vice President of Translational Research. He holds adjunct faculty appointments in the Departments of Psychiatry at Mount Sinai School of Medicine and Pharmacology and Physiology at Drexel University College of Medicine. Prior to his work at Autism Speaks, Dr. Ring served as Senior Director and Head of the Autism Research Unit at Pfizer Worldwide Research and Development and worked in the area of psychiatric drug discovery at Wyeth Research. These two new members of the Committee will serve for the remaining months of IACC activity under the Combating Autism Reauthorization Act of 2011, which will expire on September 30, 2014. If reauthorized, the IACC will be open for nominations of new potential public members in late 2014.